Strike King has developed the Slab Hammer Crappie Crank series to help you catch more and bigger Crappie! The Crappie Crank includes premium red hooks and colors designed specifically to attract crappie and dives up to 8 feet. 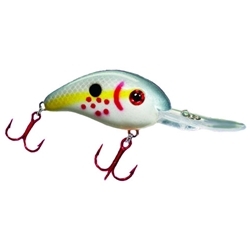 These crankbaits can be used to cast or troll using push or pull techniques and are sure to catch more crappie than any other Crappie Crankbait.